Baltimore’s Jones Falls gets another wallop of untreated sewage, DPW says. Above: Timothy Nohe took this photo of a stacked manhole spouting untreated sewage like a fountain into Western Run on Saturday – and sent it to DPW. 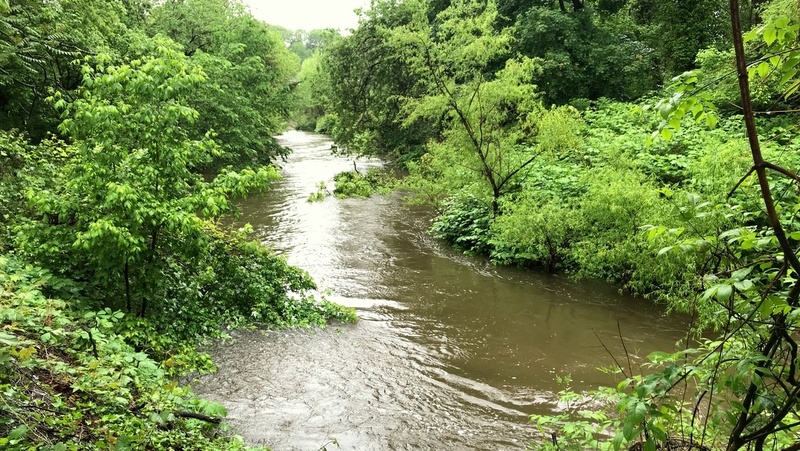 Millions of gallons of sewage-laced water have flowed into the Jones Falls and Inner Harbor following storms that swept across the metropolitan area in recent days. In public reports mandated by state law, the city Department of Public Works has disclosed that 1.2 million gallons of untreated sewage mixed with stormwater were released last Thursday into the underground portion of the Jones Falls south of Penn Station. An additional 1.5 million gallons overflowed into the stream on Saturday. The vast bulk of the discharges came from a single overflow pipe, No. 72, at 428 East Preston Street, which acts as a key safety value for the city’s overburdened sewer system. But another 90,000 gallons came from an unusual source – a sewer manhole that overflowed into Western Run in Northwest Baltimore. The wastewater flowed from Bonnie View Drive through Mt. Washington and entered the Jones Falls under the Kelly Avenue Bridge near the Whole Foods store. Over the years, cracks and holes have spread across the 100-year-old network, allowing rainwater to infiltrate into pipes and manholes, greatly increasing the volume of wastewater going to the Back River treatment plant in southeast Baltimore County. In 2002, the city agreed to end the longstanding practice of dumping untreated sewage into local waterways, a violation of the 1972 Clean Water Act. Despite more than $500 million in improvements since then, sewage continues to flow into the Inner Harbor rather than the treatment plant after heavy storms. Last year, the Environmental Protection Agency (EPA) and Maryland Department of the Environment (MDE) gave the city a 13-year extension of the consent decree. Phase 1 of the modified agreement calls for 83% of untreated sewage overflows to be eliminated by January 1, 2021. The remaining overflows will be plugged by December 31, 2030, DPW has promised. In recent years, the city has greatly reduced the number of “structured,” or engineered, sewage outfalls. 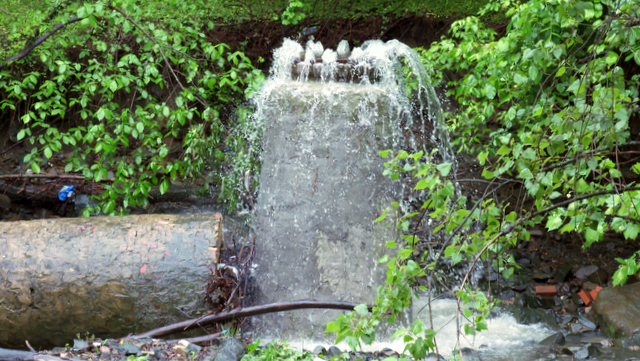 Much of the excess sewage is now discharged at the Preston Street pipe that feeds into the Jones Falls, which is buried at that location beneath the Jones Falls Expressway. DPW reports that, in the first 4½ months of this year, nearly 15 million gallons of overflow have been diverted into the Jones Falls. Over 12 million gallons were released from the Preston Street pipe, while a pipe along Falls Road, near the Baltimore Streetcar Museum, dumped almost 3 million gallons more. The biggest single discharge happened on February 11, when 5.8 million gallons of untreated sewage were released by the two pipes. The Jones Falls resurfaces from its underground chamber near the Port Discovery Children’s Museum and empties into the Inner Harbor between Pier 6 and the Marriott Waterfront Hotel.